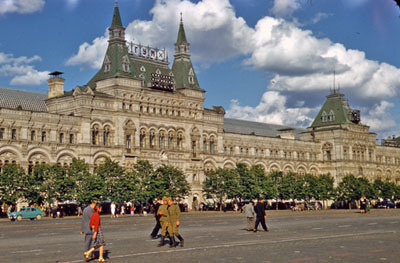 In the 1920s during NEP (the New Economic Policy), heeding the slogan to "enrich yourselves," Soviet leaders had but to look out the windows of the Kremlin, across Red Square to see GUM, (Gosudarstvennyi Universalnyi Magazin, the "State Department Store") pronounced "goom," that takes up almost the entire east side of Red Square. Built between 1890 and 1893 by Aleksandr Pomerantsev, GUM symbolized the capitalist spirit in the late tsarist regime and then the early Soviet years (until turned into office space by Stalin at the end of the 1920s). Photo courtesy Thomas T. Hammond. Read the textbook chapter 36, especially pages 503-10. Check the remarks by Professor Blois and Professor Evans on the NEP and the 1920s. Submit the Lenin's Testament paragraph. Now, the Bolshevik socio-economic policy implemented during the Civil War was called "War Communism." I have available Professor Hammond's notes on war communism and the transition to the New Economic Policy (*.pdf file). For a maximum of 50 points extra credit, read Mikhail Bulgakov, Heart of a Dog and write a one-page paper about the Soviet regime's attempt to create the "new, socialist man." For a maximum of 50 points extra credit, watch Doctor Zhivago and compare the movie to the book in a one-page paper. For 50 points maximum extra credit, read Nina Tumarkin, Lenin Lives! The Lenin Cult in Soviet Russia (1983) and write a one-page paper explaining how the cult of Lenin developed after Lenin's death. For 50 points maximum extra credit, read Stephen Cohen, Bukharin and the Bolshevik Revolution: A Political Biography, 1888-1938 (1973) and write a one-page paper in which you explain why Bukharin was unable to challenge Stalin for leadership of the communist party. For 50 points maximum extra credit, read Evgenii Zamiatin, We (1924) and write a one-page paper in which you explain the author's satire. For a maximum of 25 points, read Stalin, "Socialism in One Country," and write a paragraph analysis of Stalin's main ideas.